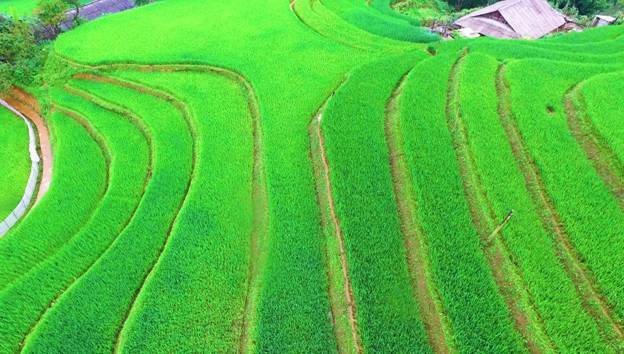 In the last days of August and early September, the Fansipan landscape becomes a stunning natural painting with wonderful green rice steps on terrace fields that will win the heart of any visitor. The green carpet is more miraculous when viewed from above. No longer as sparkling as at the beginning of the new rice season, when the terraced fields are soaked with water, and also not as colourful as the ripe rice season, the Muong Hoa valley in Sa Pa town in early autumn is filled with a lush green colour, causing everyone to fall in love at first sight. On the sloping mountains, the terraced fields take visitors into a mesmerizing maze of verdant growth. Struggling in the green domain, it can be easily understood why the world media has highly regarded the terraces of Sa Pa as some of the most beautiful terraced fields in the world. Fansipan landscape is a stunning natural painting in early September. The maiden rice field in smooth green combined with green maize carpet runs onto the hill like stretching to the horizon. 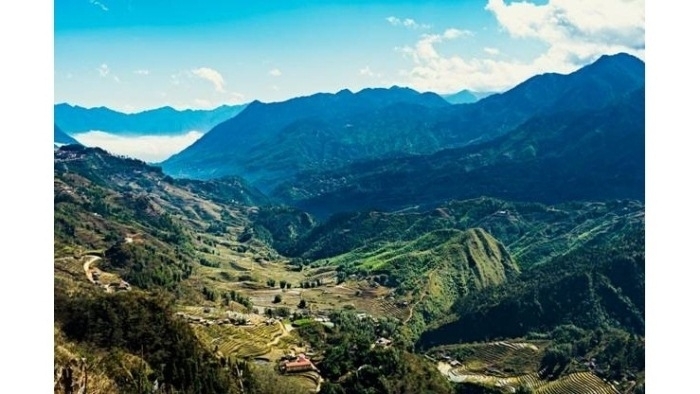 Long ago, to admire the panoramic green scenery, travelers did not regret their effort to climb up the mountains surrounding Muong Hoa valley to find a high area for setting up their cameras. 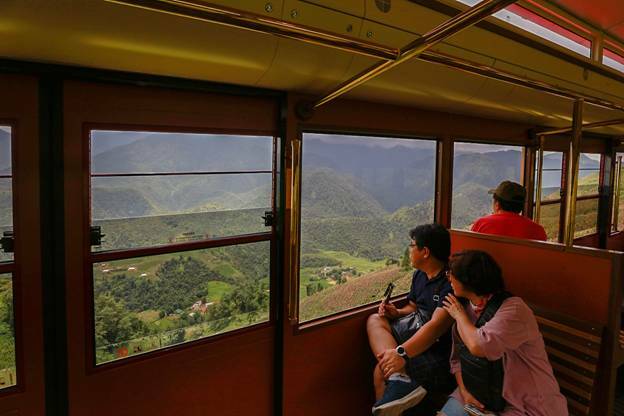 But now they can easily enjoy the beautiful scenery from a height of 1,600 metres, thanks to the Muong Hoa mountain train, or from a cable car system at 3,000 metres. 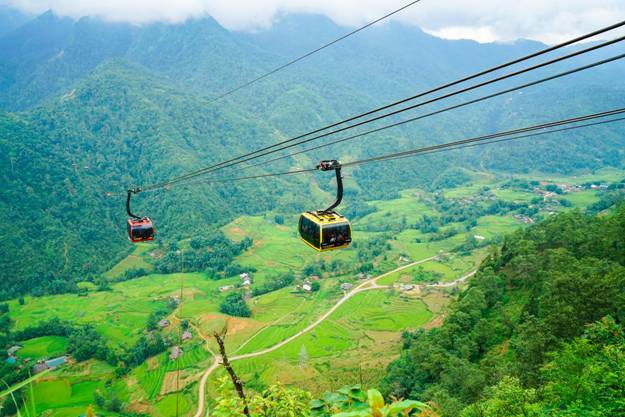 Departing from Sapa town centre, the luxurious red carriage passes the most beautiful views of Muong Hoa valley, straight to the Fansipan cable car station. Outside the window, the terraced fields continue to climb, like a ladder leading to a fairytale land. 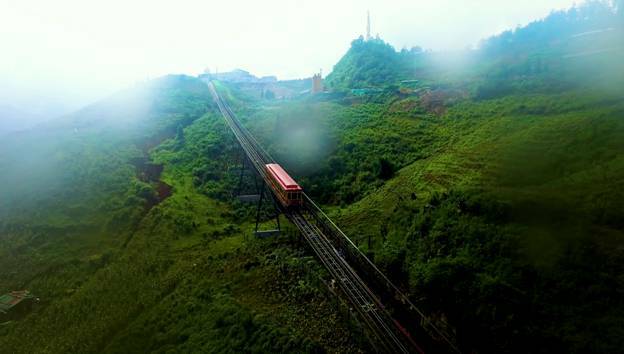 The price for an exciting trip surprises many visitors at just VND50,000 for a return ticket. 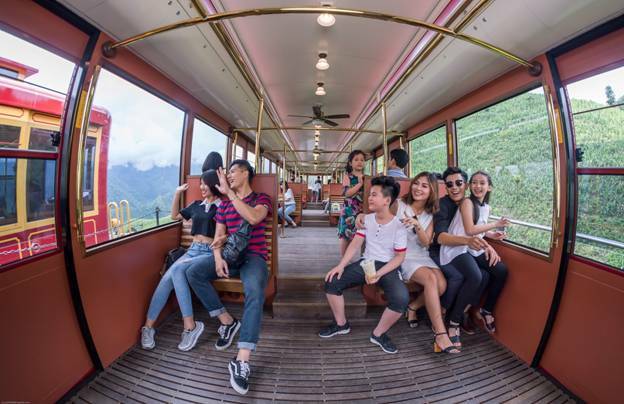 Connecting to the mountain train rail, the Fansipan cable car system takes visitors even higher to capture the full colour of the Muong Hoa Valley amid the deep green mountains of the Hoang Lien Son Range. 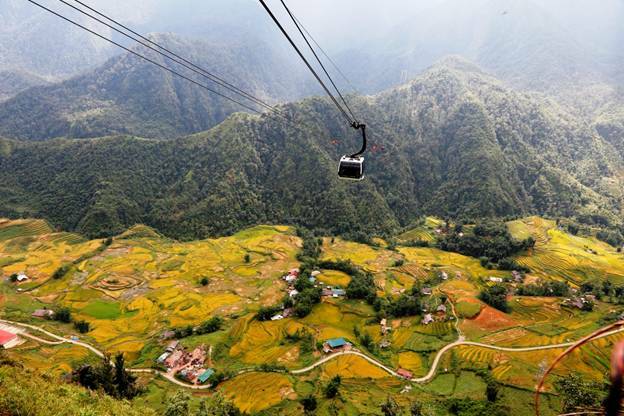 Nestled among the green are peaceful stilt houses and small winding roads carved into the valley like soft silk stripes. From the first week of September, many rice fields will be ripening. The green carpet has the extra colour of the sun. Passing through the green valley then going higher up to see a mysterious and majestic Hoang Lien Son Mountain Range in dark blue. 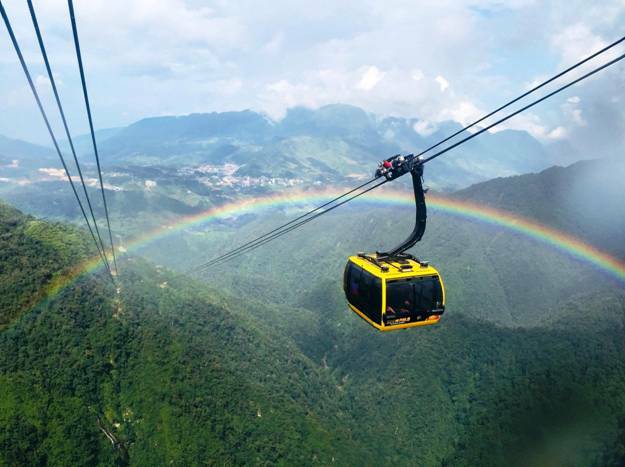 If lucky enough, visitors will be flying through magical rainbows like this. The journey to the peak of Fansipan has always hidden something that is so pleasant and surprising. 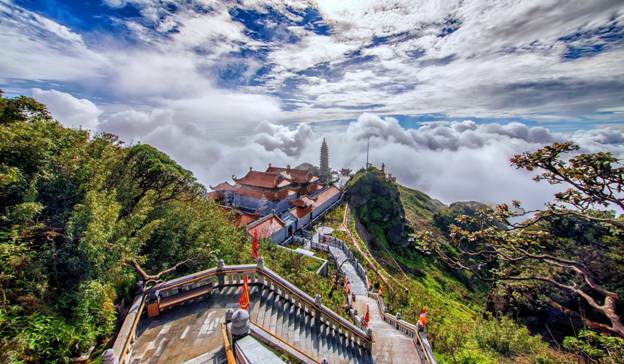 At the end of the journey there is a sacred temple complex in the clouds. 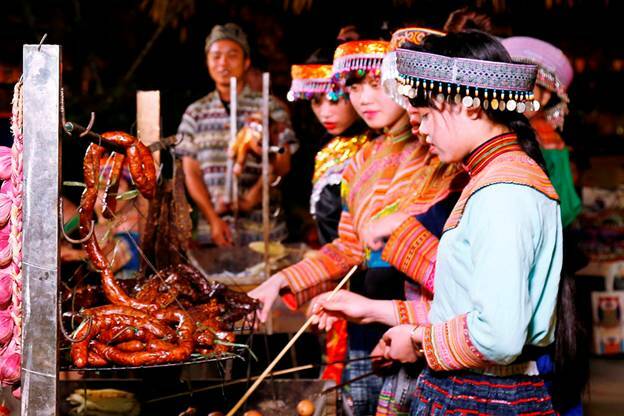 After discovering the sacred architectural works created on the peak of Indochina, when down the mountain, enjoying delicious highland cuisine creates an unforgettable memory for visitors coming to the Northwest. 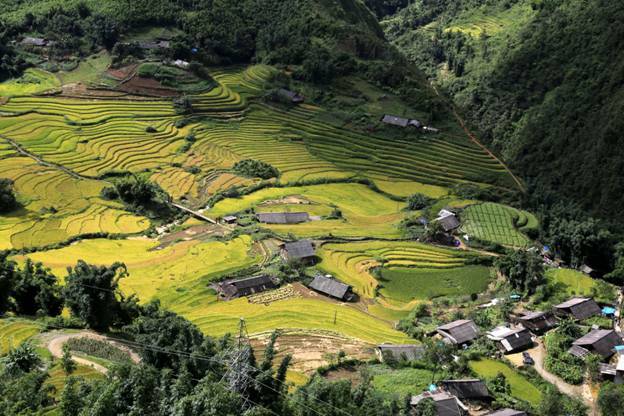 Sa Pa green rice season is difficult to resist, because by mid-September, the green carpet will turn to brilliant yellow that no one should miss it.